This traditional farmhouse (also called Masia) is located in a charming village only a couple of kilometers from the spectacular sandy beach. Your very large holiday home is a farmhouse built in the traditional style which has been decorated in a very characteristic way. The large home has three floors and offers plenty of space for a large gathering of people. There is a large living room, a large kitchen and a separate dining area. The home owner has arranged some accessories for you in the kitchen, including; oil, salt, herbs and spices, rice, pasta, etc. He would like to ask you to please replace whatever you use, for the next guests. All spaces have been decorated neatly and traditionally. The large amount of bedrooms and bathrooms makes sure that there is plenty of privacy for everyone. The large garden has a gigantic swimming pool, sun loungers and a large terrace. 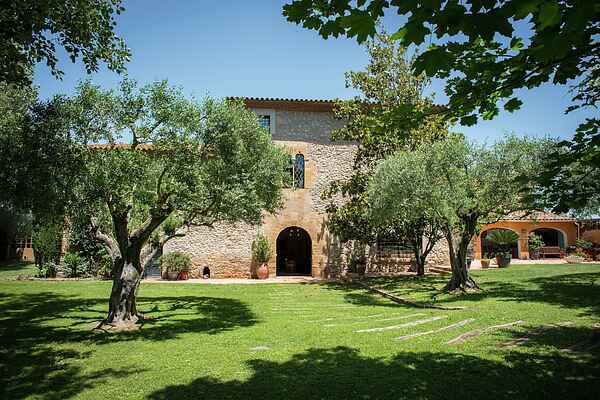 The exclusive Masia is rurally situated in a small charming village of the Baix Emporda district, a few kilometers from the beach. Here you can enjoy the gorgeous sandy beaches, beautiful bays, several watersport activities but it's also the place to go for spectacular walk or biking trips. Golf enthusiasts can go play on several terrific golf courses. Go visit the surrounding villages, let yourself be surprised by the local cuisine. Figueres is located approximately 30 minutes away by car, here you'll find the Dali museum.